the “Walkstation”, from Steelcase. starting at $4,399. Lately I’ve been thinking a lot about how to unplug, particularly from desktop computer use. I’m long inured to epic computer sessions — many-houred trance states, almost. Some people can go for 24 hours or more at this with just snack breaks, which can’t be good. For many reasons, especially health in all forms. As discussed in the recent NY Times article “Is Sitting a Lethal Activity”, new research suggests there may be a huge health issue caused by pervasive unhealthy sitting postures, and computer-use postures, and just the fact of pervasive *sitting* at all; it may be a prime factor in the incidence of obesity in our society. The article focuses on obesity and related issues, but in addition there’s the millions of cases of repetitive-stress injury, and who knows what in eyestrain, general stress, back problems, and general unhappiness. I have a pet analogy: in earlier times, scientists and technicians working on atomic energy projects would walk around carrying unshielded radioactive materials; factory workers painting watch faces with radioactive luminous paint would routinely lick their brushes to sharpen them; nobody knew, or knew for sure, that these were deadly activities, until the workers began to die of cancer at epidemic rates. Likewise, I imagine that decades from now, people will look back at our time and be horrified that once, hundreds of millions of people in (mainly the rich) world would sit in a chair for 10-15 hours a day, directly in front of a monitor, typing or using a mouse. They’ll say, but how could they have gone so long and not seen the correlation to …. cancer rates. or perhaps epidemic obesity and metabolic disorders, or pervasive developmental and mental disorders like ADHD, etc. I know the bulk of humanity aren’t office drones, and may have other, more prosaic concerns such as lack of clean water, or AIDS, but let’s focus on the leading-edge first world for now. The obesity and developmental-disorders problems mentioned might more likely correlate to television watching.. but maybe the office computer is like a workplace version of television, from a health standpoint: a great vegetating, obesity-generating, mind-numbing force. Anyway so here are just some ideas, mine and others’, of ways large and small, symbolic and real, to reconnect virtual (inside your computer) with real world. Set up webcam at your office building, pointing outwards to show weather, daylight level, and street life. (if you hopefully have street life, and haven’t been virtualized away to a lifeless office park or campus). Then, on employees’ computers, set the default wallpaper (desktop background) to be an regularly-updating view from the webcam — there are various free programs to do this. The reason is obvious: in a lot of offices, a lot of people are getting very little natural light, or cue as to what’s going on outside. I’ve thought about this one for year and years, since way back when I first worked in a cubicle in the ’70s. But I haven’t heard of it being done anywhere. Set up or designate some communal social space — e.g. a break room or lobby area or part of the cafeteria — and designate it “live”. Set up webcam onto this space. Feed webcam stream into default employees’ computer wallpaper. So, you can have some remote connection to who is hanging out, you can perhaps join your friends if you see them there, and you can go there yourself and have more chance of running into your friends. A more public version of this is the bar or cafe that sets up a webcam and puts it on the Web, so presumably you can check out who’s there before coming down. This used to be done occasionally, back in the day when webcams were relatively new. Obviously, privacy concerns arise, so I think the practice faded. I don’t know if anyone tried what I was thinking of, visibly designating just part of the venue as “live”. Borrowing a technique from agile software development, do meetings standing up when possible. Not only does it help keep meetings quick and focused, but it keeps people’s bodies in motion, and works against the relapsing into Blackberry / smartphone or even laptop use that can happen during a sit-down meeting. Actually quite simple: mount a desktop over a treadmill, walk while you work. These exist, are in production from leading office-furniture company Steelcase: the “Walkstation”, from Steelcase. starting at $4,399. (see photo at top of post). The ones that exist are made for office environments, thus presumably walking, but I’ve been thinking I could really enjoy something like this at the gym. Rather than five TV channels of trash that I have to choose from now, I’d be most happy if I could carry on my preferred news-reading, Web video-watching, Wikipedia-reading, and general Web foraying, while running or bicycling. I see an opportunity for high-end, professionals-oriented gyms here. The treadmill workstation (right, the vendors don’t call them “treadmills”, but I will) is greatly ironic: it’s like a comically absurd symbolization of the modern office worker as poorhouse drone; but in fact, might be a great gift to the employee. Yes, and gift of employer to itself, by reducing health-care costs and health-related productivity loss. Set up office computers so that every so often, say every two hours, the system will gently log you out for ten minutes or so. It will be unavailable for that time, so you may as well take a power nap, do you calisthenics routine, or walk around the block once or twice. Ok, there are some practical issues like not interrupting you if you’re on a conference call or Webinar, etc., but it can be worked out. Perhaps, you can get a button to override for one hour, or the logout won’t happen during scheduled critical times. In offices where workstations and seating positions are relatively interchangeable, and people use thin terminals (i.e. their files and programs are on the network drive, not local), periodically the computers log everyone off for a period (as in #5). However, in this version, the twist is that after ten minutes, your session with your open files and programs will become reavailable on a different workstation somewhere in the office. After doing your power nap or coffee break, you have to find out where in the office you’ve been transferred, which involves a fun game of everyone roaming around shouting out who’s where. Then, you have to adjust your body to the chair settings, monitor position, different lamp, etc., of the workstation’s prior user. Hilarious! Alright this isn’t quite serious but the point here is to make us think people. The recent Mayo Clinic research from that NY Times article tells us that unchanging, sedentary body positions greatly impact our metabolisms. Common sense and experience tells us that an unchanging position in a chair, or craning at a screen, is uncomfortable. Yet, unchange and crane we do, as the research shows. Concentration apparently immobilizes people, and so we really ought to keep changing our positions. But why rely on us to remember to move, when we have machines to be clever like that? So, the monitor: mine, for example, sits on a little platform I made that rolls easily in all directions and fits the keyboard in underneath. It would be quite simple to make a monitor stand (hello, Steelcase!) that was like this but had a few little motors attached to the rollers and randomly timed such that once in a while, it would gently slide left or right or forward six inches. More sophisticated applications of this idea would be monitor arms that changed positions, or adjustable-height desks that changed. You could also put your lamp on a timer so it would periodically conk out, and you’d be forced to get up to reset it. (I know, neither your cubicle / table segment nor mine are big enough to require any “getting up” to change the lamp; or, also bad, there is no lamp that you have any control over, just totalitarian ceiling fluorescents or whatever. So plug something in whose outage will cause a reaction. We’re just trying to get metabolism into the work environment, however how). When people started using and got used to smartphones, especially the iPhone, often they were and are surprised to learn how many formerly “computer” tasks can actually be done with it. Particularly with a beautifully-designed implement like the iPhone, people become attached to it in a way that they don’t generally feel about a desktop PC, and they want to use it instead of the PC, even perhaps for, say, tasks that seem to be large-screen oriented. I find that I’ll walk over to my desk to check email, and pick up my iPhone to check on it rather than looking at the desktop PC. The phone, I pick up and hold in just the position most comfortable to how I’m standing; the PC demands that I stoop to it. It’s like the old distinction between “lean forward” technology such as the PC and “lean back” technology such as the television. Likewise, a common experience with the new tablet computers (led by Apple’s iPad) is to feel released from the desktop, or even a desk/table (i.e. as laptops are typically used on), and find oneself using it on the couch, in bed, or in new places on the go. More speculatively, I also imagine devices / interfaces becoming widely available that are wall- or room-sized. 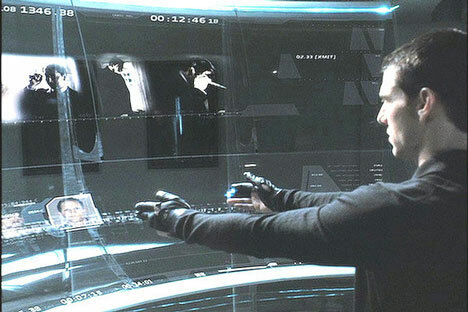 As perhaps most famously imagined in the 2002 movie Minority Report, in which the detective played by Tom Cruise uses a special room filled with panels of transparent LED displays, controlled by laser mice in his gloves, to rapidly explore ream of image and database data about his suspect. (See Minority Report science adviser and inventor John Underkoffler demoing his current version of this at a 2010 TED event). Note, in both cases, the user is standing up, and making significant body motions (arms) to work the display; also, there is a social component, because the operator’s activity is displayed large enough for colleagues or an audience to watch and participate. Yes, many of these design ideas have been villified by other interface designers as unusable, clueless fantasies. Yet I can imagine the room-as-interface (what Underkoffler calls the “luminous room” concept) having important applications. For example, in collaborative meetings and videoconferences, where groups of people must gather a lot of visual materials, brainstorm, decide, perhaps working from far-separated geographic locations. Or, educational software (including training materials, in the corporate context) that employs large-scale interfaces — and perhaps gamification (use of game-play mechanics) — for a more effective and healthy whole-body experience. Some of the above techniques assume that computer immersion is a problem requiring interruption. Others propose integrating motion into immersive computer activity. Ultimately I think the latter has more potential, because obviously it’s not disrupting the user’s concentration. It suggests a new definition of unplugging: being plugged in to the computer while still thoroughly plugged in to your body and the physical world.